Dallas Ebola hospital performance: Texas Health Presbyterian has mostly average outcomes, but a slow ER. 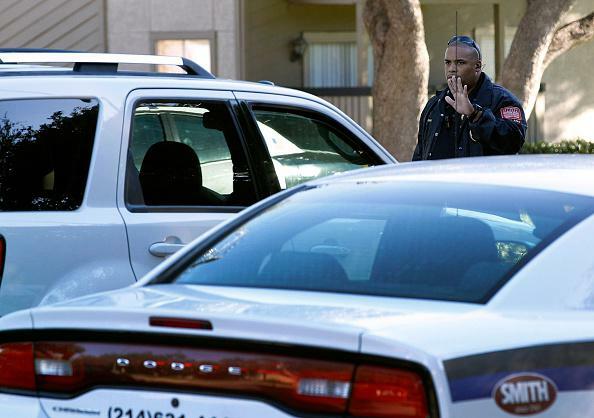 A security guard at the apartment complex where the second Dallas health care worker to contract Ebola lives. According to the CDC, the Dallas health worker who tested positive for Ebola last night—and had been on a commercial flight from Cleveland to Dallas on Monday—should not have been traveling. The error is another in a growing list of mistakes made in response to the initial Ebola case treated at Texas Health Presbyterian Hospital Dallas. Is Texas Presbyterian an incompetent hospital? Information gathered by Medicare officials says the hospital’s rates of infection, readmission, and mortality are on par with average rates both nationally and in the state of Texas. Its ER wait times, however, are much longer than state and national average. The average wait time before inpatient admission at Texas Health Presbyterian was 352 minutes, compared to the Texas average of 270 minutes and 274 minutes nationally. A national nurses’ union has released a statement, which it says is based on information provided by Texas Health Prebyterian nurses, alleging that Ebola patient Thomas Eric Duncan was left for “several hours” in an open area of the hospital’s emergency room before being isolated on Sept. 28. Health officials have announced that the newly ill worker will be moved from Dallas to Emory University hospital in Atlanta, which is one of four locations in the United States specially equipped to handle infectious diseases like Ebola.